Only 55 days left until the season 7 premiere of Dexter and the official trailer for the upcoming season is scheduled to air very soon. 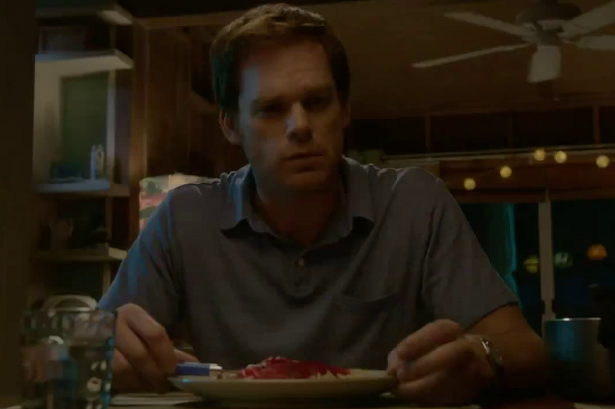 The extended trailer was screened on Monday at the Dexter TCA Panel 2012. OMG. Been waiting so long. I doubt it will top last years trailer though. Last season trailer wasn't that good. A compilation of 1 second sequences with a music doesn't make a trailer for me. It looked like a fan-made trailer. The opening with Joe Walker was poorly edited too. Trailers from seasons 3, 4 and 5 were way better. It wasn't that good just for using Manson's version of Personal Jesus. I'm with Anon @ 6:09...I prefer a trailer with at least some dialogue. Trailers like that are just more exciting to me. Actually, I'm surprised were're even getting a trailer, with all the promos and such they have already released. I thought the sneak peek served as a trailer just fine. It provided no insight regarding the new characters and plotlines of the season. That's typically what qualifies as a trailer. When I first saw the Season 6 trailer i really thought season 6 was gonna be a hell of a Season!! Now I'm not intentionally trying to hate on Season 6 but, being a Dexter fan since season 1, I really have to say Season 6 was one of the weaker seasons!! Not saying it wasn't good though!! There were select few episodes that were great!! But I honestly think the writers could have done more with Brother Sam and definetly Brother Brian!! They are both great characters!! I do have to say though... when Dexter is in trouble, that's when he's at his best!! And in Season 2 he was outstandingly genius! But these past couple seasons it seems as if the writers are making him out to be an idiot!! I mean just compare Season 1 or definetly Season 2 to any of the newer seasons!! You will definetly see my point!! I want the controlled, on the spot thinking, intelligent Dexter back, like the one we saw in Season 2!! I really think what Season 7 needs is a very strong story line, one that is suspicious enough that you won't be able to predict what's gonna happen next!! We need to bring back Brian! Because, in my opinion, when I see them together there is always such a great chemistry, and since the Season 6 finale, I can only imagine that Harry Morgan isn't too pleased with Dexter!! So if we can have some kind of conflict between them that would be great!! And also.... I've heard that Lt. Laguerta finds Dexter's blood slides at the DDK crime scene!! Which will only mean she will be, once again, tryign to clear Doakes's name!! What I would personally like to see if some flashback... but with Doakes! I believe that Doakes left the series wayyyyy too early!! He was one hell of a character!! But don't get me wrong.. when I say flashbacks.... I don't mean when Doakes was a kid, like what they're gonna be doing with Dexter and Debra! What I want to see is some kind of dream or memory with Doakes in it!! Either from Laguerta or Dexter! Because I know Laguerta can go really far into this investigation if she wants to!! So I really hope this Season is a step up and I hope it's similar, but not mimicking, Season 2!! Because the "not since season 1" fans are convinced that Dex and Deb are biologically related. No, It's (mostly) the old Dexter fans who think Dex and Deb are biologically related. It's also the old fans who didn't see Deb's feelings for Dexter coming..They need to re-fresh their memory and re-watch the show. It doesn't matter how long you have been a fan... this is the DVD age. A person could start Dexter last week, watch all the DVD's since season 1, and have an even better experience of the show than the people who started viewing it in chunks since the pilot 7 years ago. i dont want to see it!!! i want to go into the premier knowing nothing. why am i even on this website??? AACKKK!! So were is this trailer not trying to sound cocky but I understand there is going to be leeks and that but *SPOILER* from what we have seen we all no travis gets burnt my personal opinion I think they should have had the 2 Minute Sneek Peek and that's it and made us wait in tension and no disrespect to Lauren Velez but in an interview you don't say Laguerta finds one of Dexter's blood slides and reopens the BHB (Bay Harbour Butch) case I mean I no you all think im just here to moan im not i LOVE this show its my favorite show but they just need to keep there mouths quiet about things like that but all do respect BEST SHOW GOING(my opinion).